Lunch is a time when kids get a chance to relieve some stress, refuel and interact with their friends. 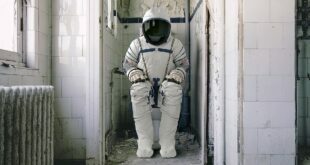 Each and every one of us has had a different experience with school and especially lunch times. While some choose to bring their own lunch from home, others decide to eat what the school has to offer. Think back to the days of your childhood in the cafeteria. 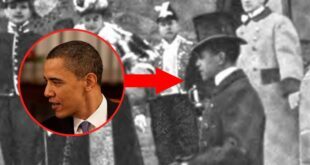 Chicken nuggets, corn dogs, nachos or pizza slices, whatever it might have been, the menu is not quite the same today. There’s a greater push for schools to step up their nutritional programs and parents are concerned about the quality of food their kids receive at school. 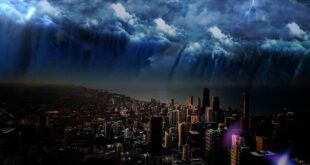 Of course, this is all here in America. But what about the rest of the world? 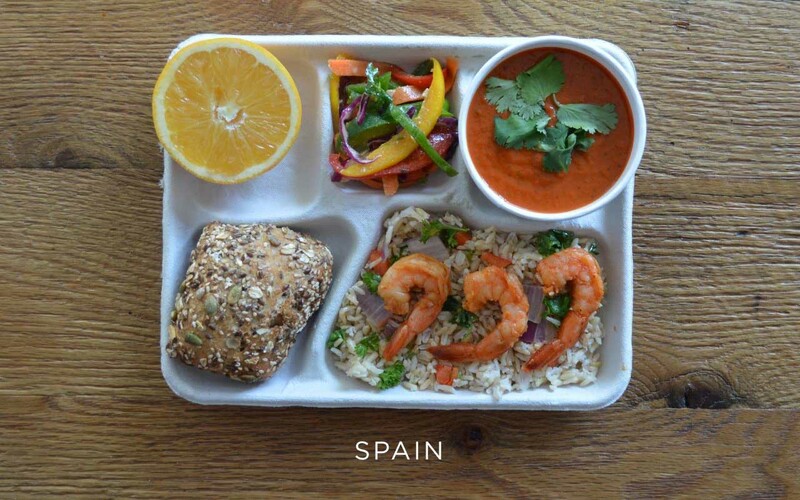 Have you ever wondered what lunch meals look like in other countries? Whether they are the same or filled with a variety of foods? 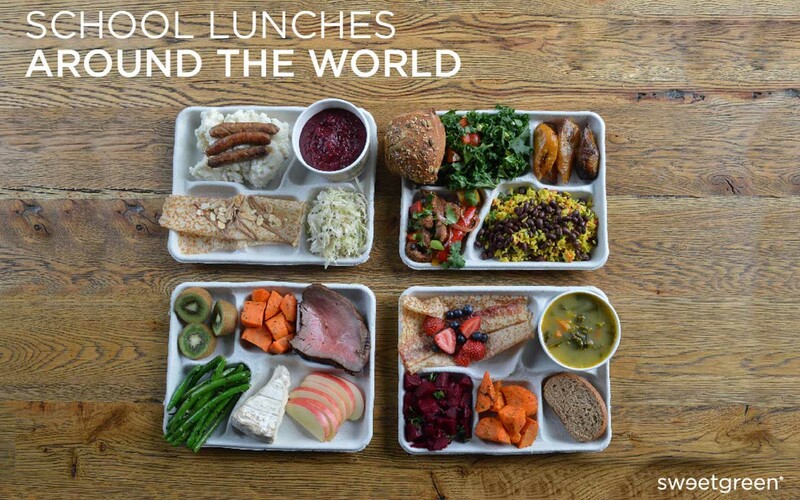 Well, we have gathered 9 international school lunches and their take on cafeteria cuisine. 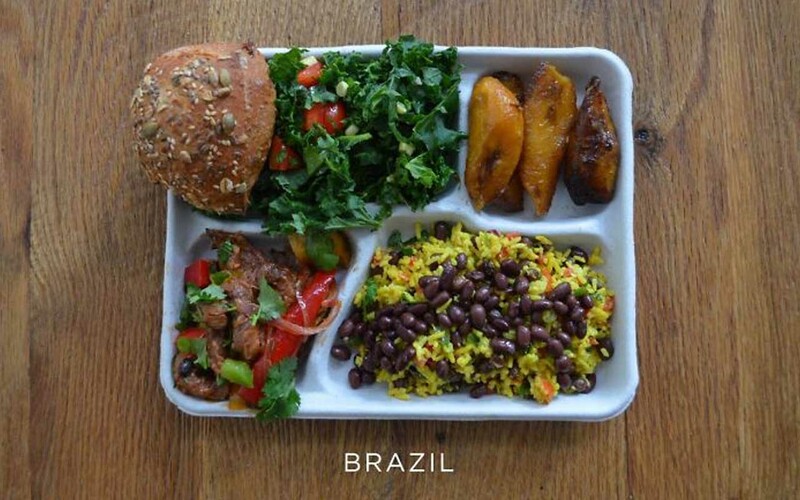 When it comes to feeding the children, Brazil spends approximately $1.3 billion a year. The country has a national school meal program known as the Programa Nacional de Alimentação Escolar, or PNAE. The program, which started in 1955, helps to feed children in need and at the same time helps small farmers sustain business. 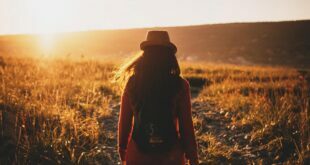 In 2009, the country passed a legislation that requires at least 30 percent of food purchased for the program to come from small family farmers. Vegetables cooked in olive oil and tomato are a main course in Greece; which is often eaten with bread and cheese. 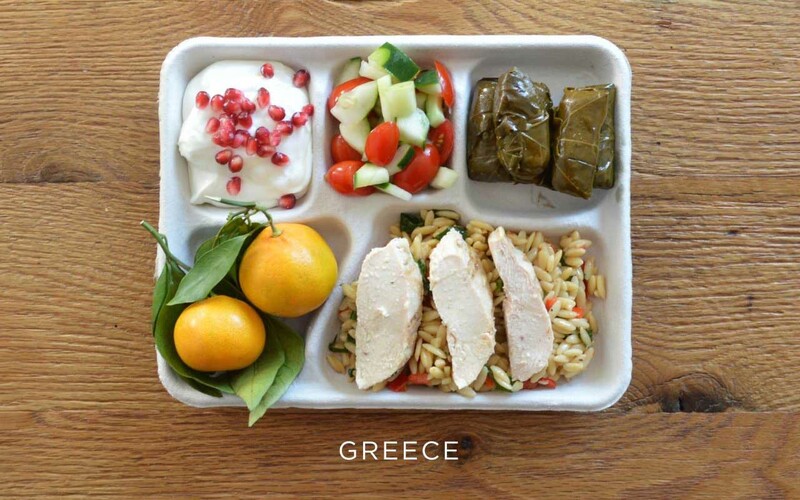 A typical school lunch menu for children including pre-school and kindergarten have the following lunches throughout the week: green beans cooked with olive oil and tomato accompanied with feta cheese, peas cooked in olive oil along with feta, lentils, roasted chicken with vegetables, beef patty with vegetables, soup with beef and vegetables and spinach. They also have pizza once every blue moon and it comes with just cheese and tomato. Pea soup, beet salad, carrot salad, bread and pannakkau (dessert pancake) with fresh berries. According to The Atlantic, the Finnish education system has a higher efficiency than any other country in the world. Finnish schools are either public or publicly funded. In 1948, Finland became the first country in the world to provide free and healthy meals to school children; and has done so ever since. 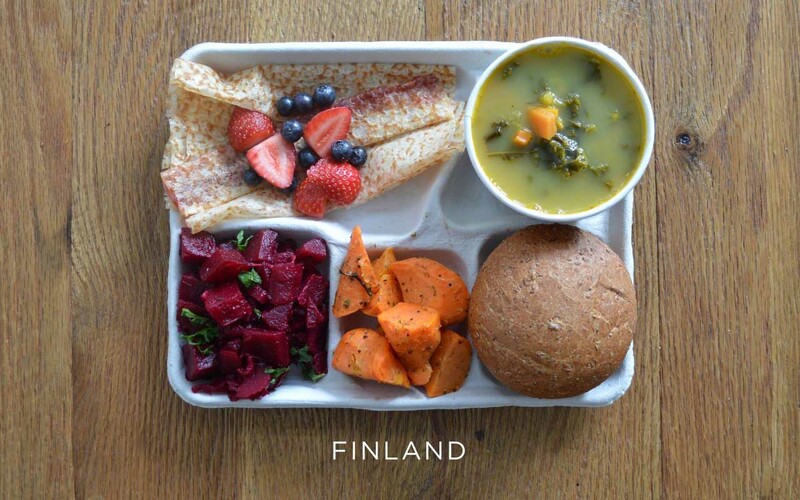 The Finnish School Meal Network ensures that the contents of the meals are healthy and free for every student. Mashed potatoes with sausage, borscht, cabbage and syrniki (a dessert pancake). 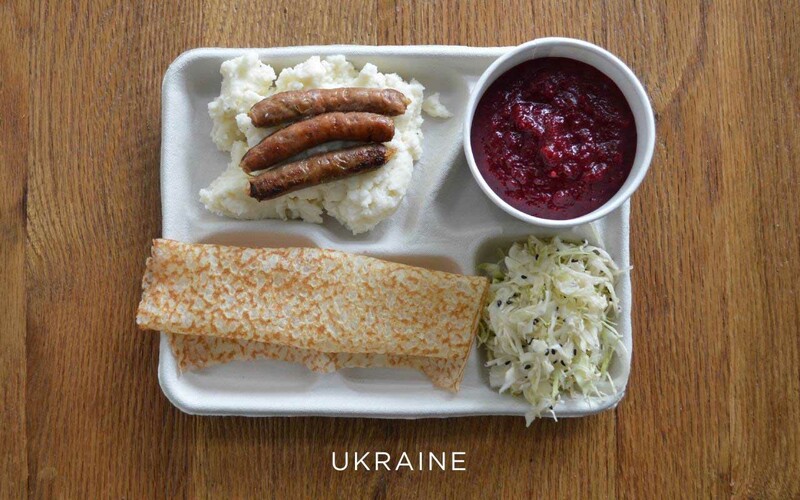 Ukrainian school meals are primarily meat-based. They usually start with a soup such as traditional Ukrainian borscht (mixture of beets, vegetables, and meat) and is followed by sausages or cutlets which are served with mashed potatoes or buckwheat. For the finale, they have syrniki – a dessert made with chocolate-covered cream cheese. Education is also free in Ukraine, and for college, students have to attend entrance exams. 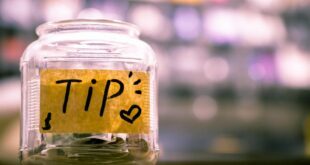 If they score high on the exams, they attend the colleges for free, while those who scored low have to pay an annual fee of around $800 to $1,000. 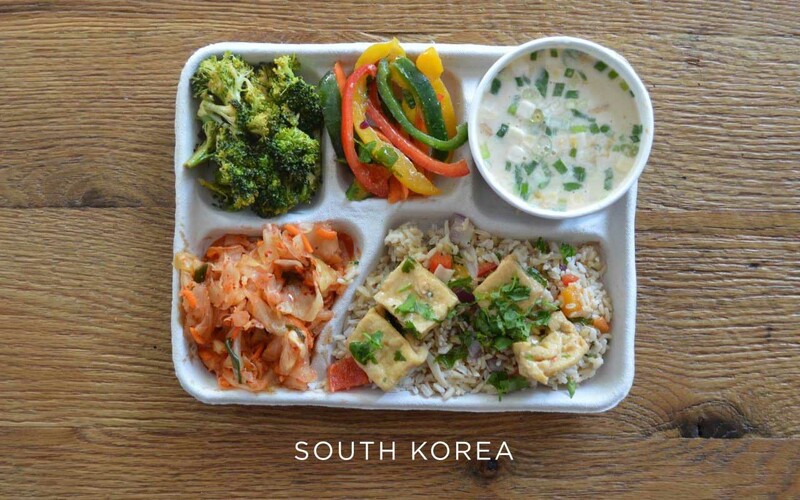 South Korean schools provide lunch in a different way. The larger portions are normally filled with traditionally cooked rice, kimchi (fermented cabbage) and soup. The smaller portions contain any form of meat and other veggies. Schools also provide Western-style menus to choose from. In public schools, it is also normal for students and teachers to eat together; in order to save time. Soup and rice is served in almost all meals, since it is part of Korean culture. Reports indicate that one in three Italian children under 12 years is overweight; far behind those of the United States and the United Kingdom. Italy, however, is working hard to fight this and promote a healthy eating pattern for adult life. 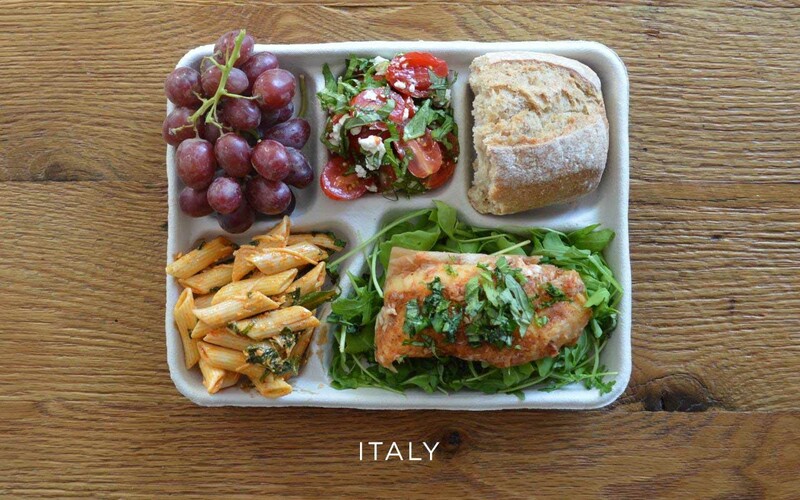 Today, Italian school menus offer culinary traditions to teach kids about nutrition and healthy habits. School lunches often include a starchy dish (alternating rice, pasta and soup), a main course (based on meat, fish, eggs or cheese), two or more vegetable side dishes and plenty of fresh fruit. Sautéed shrimp over brown rice and vegetables, gazpacho, fresh peppers, bread and a slice of orange. In Spain, lunches are called la comida and have several courses to choose from. The dishes are prepared at school every morning and is delivered to the tables. There are no lines, trays or desserts. Both children and teachers sit face to face on long tables where the food is delivered to them. French children in particular do not suffer from weight problems, obesity, diabetes or hypertension, like their American counterparts. There’s a good reason for that. 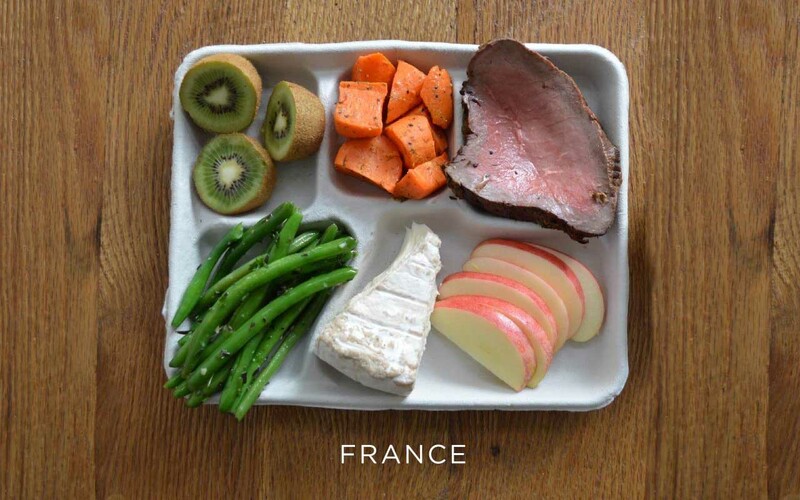 The public elementary school cafeteria, or “canteen” as the French call it, serves moderate quantities of fresh and freshly prepared food at different intervals of the day. Apart from that, schools also ensure that children get the proper exercise daily. There are three recess periods every day; two 15-minute intervals and a 60 minute interval. Schools have dieticians who calculate the calorie intake. If the dietician thinks that the lunch menu for the week has too much sugary foods, they will compensate it with another food which is less sugary. 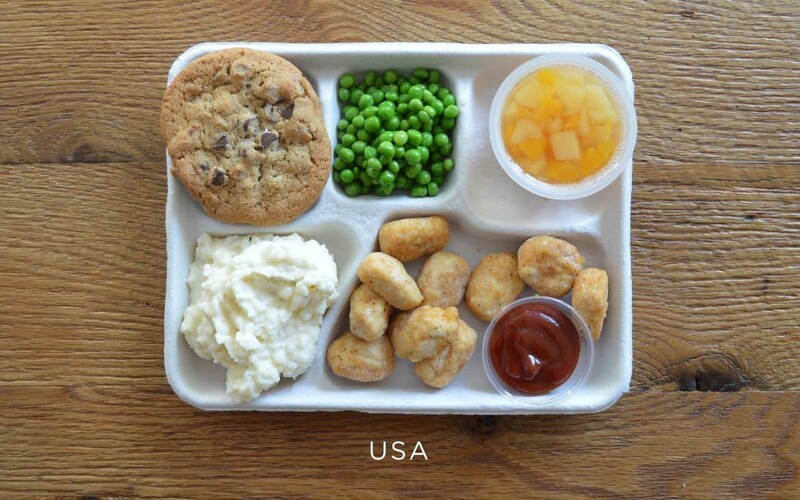 Fried ‘popcorn’ chicken, mashed potatoes, peas, fruit cup and a chocolate chip cookie. According to Katie Wilson, deputy under secretary for food, nutrition and consumer services in the Agriculture Department, American children are eating 16% more vegetables and 23% more fruit at lunch than ever before. In 2012, The Healthy, Hunger-Free Kids Act took effect that requires school lunches to be low on calories, sodium and fat. While French schools provide children with more time to eat their meals, lunchtime in America differs from school to school.